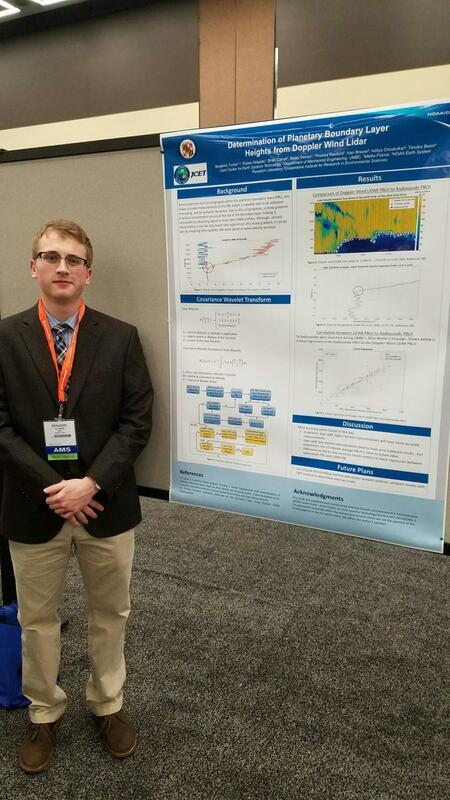 UMBC Mechanical Engineering undergraduate student, Benjamin Tucker, was one of the nine undergraduate students given the the Outstanding Student Conference Poster Award at this year’s American Meteorological Society meeting. Ben’s research is titled “Determination of Planetary Boundary Layer Heights From Doppler Wind Lidar Measurements“. UMBC Atmospheric Lidar Group students and faculty had a total of seven presentations at the 97th American Meteorological Society meeting held in Seattle, WA. NOAA’s Office of Education announced $11.9 million in grants to four lead minority serving institutions (MSIs) across the country. The funds will be used to educate and graduate students who pursue degree programs with applied research in NOAA mission-related scientific fields. UMBC is a partner institution is two of these MSI centers: NOAA Center for Earth System Sciences and Remote Sensing Technologies and the Center for Atmospheric Sciences and Meteorology. UMBC Physics undergraduate student Kweku Mills-Robertson (NOAA CREST) won 1st place Poster Presentation under the Weather Ready Nation category at the National Oceanic and Atmospheric Administration (NOAA) Educational Partnership Program (EPP) with Minority Serving Institution (MSI) Eighth Biennial Education and Science Forum at City College of New York. Kweku’s research is titled “Using Ceilometers to Determine Planetary Boundary Layer Heights”. The National Oceanic and Atmospheric Administration (NOAA) Educational Partnership Program (EPP) with Minority Serving Institution (MSI) Eighth Biennial Education and Science Forum will be jointly hosted by NOAA EPP/MSI and NOAA-Cooperative remote Sensing Science and Technology Center (NOAA-CREST) from August 29-31, 2016.
to promote professional development for (STEM) undergraduate and graduate students. The theme of the Forum is “Advancing NOAA-Mission STEM Fields through Education and Research Collaborations: Building on a Successful 15-Year Partnership with Minority Serving Institutions” The Forum will emphasize the important role educational partners such as the four EPP/MSI Cooperative Science Centers (NCAS, ECSC, LMRCSC and CREST) have contributed to the NOAA community in the last 15 years by advancing NOAA sciences, student training, mentoring, adding diverse members to workforce, and increasing awareness of NOAA science mission to communities external to NOAA. The purpose of the Forum is to showcase and promote NOAA education and scientific research accomplishments conducted at the CSCs and to present results through oral and poster presentations by students, faculty and NOAA scientists and managers. Other participants will include the private sector and the NGO community, invited members of US Congress, NOAA and invited speakers. With the current fiscal environment, participants will also explore ways to enhance efficiencies with partnerships between NOAA and the public and private sectors. More than 60 percent of the Forum participants will be students pursuing post-secondary degrees in various NOAA STEM fields. For more details, visit event website by clicking here. 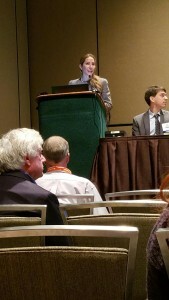 Alexandra St. Pé doctoral research, “Improving Offshore Wind Energy Resource Estimates Using Doppler Wind Lidar: Research to Operation”, was awarded a best poster presentation at American Meteorological Society meeting Seventh Conference on Weather, Climate, Water and the New Energy Economy in New Orleans, LA. UMBC Geography and Environmental Systems graduate student, Alexandra St. Pé, won first place in the Resource category at the American Wind Energy Association Offshore Wind meeting held in Baltimore, MD. Her presentation is titled “Improving Offshore Wind Energy Resource Estimates Using Doppler Wind Lidar: Research to Operation”. The Cooperative Institute for Climate and Satellites (CICS) hosted NOAA NESDIS Cooperative Research Program (CoRP) Science Symposium for Students at the University of Maryland on September 16 and 17, 2015. The CoRP Student Science Symposium utilizes significant STAR, NOAA and University/Academia efforts to further remote sensing research and applications. The Symposium targets multidisciplinary research with a focus onundergraduates, graduate students, post-docs, and early-career scientists. It is part of a larger strategy to promote federal and academic partnerships. The Symposium also highlights research and application development within NESDIS and its Cooperative Institutes and Cooperative Science Center which includes — CIMSS, CIRA, CICS (CICS-MD & CICS-NC) and NOAA-CREST. UMBC undergraduate student, Shelbi Tippett, won first place in the speaker category. Her research is titled “Remote Sensing Monitoring of Canadian Wildfire Smoke and its Impact on Baltimore Air Quality”. 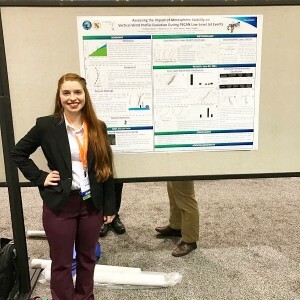 Atmospheric Lidar Graduate Students Alexandra St. Pé (Geography and Environmental Systems) and John Sullivan (Physics) were tied in 3rd place in the 7th Symposium on Lidar Atmospheric Applications at 95th American Meteorological Society Annual Meeting in Phoenix, AZ. Alexandra’s St. Pé presentation titled “Using Doppler Wind Lidar to Assess Meteorological Controls on Offshore Wind Power Generation” discussed meteorological controls on wind energy parameters, which could reduce uncertainty in offshore wind energy projects. In particular, this research contributes to a more accurate estimation of variability in power curve performance, energy loss due to turbine wake effect, and Annual Energy Production. UMBC Atmospheric Lidar Group deployed Doppler wind lidar technology to collect vertical wind profiles (40m- 200m) in Maryland’s Wind Energy Area (WEA) onboard the Scarlett Isabella during the State sponsored Geophysical Survey from July- August 2013. 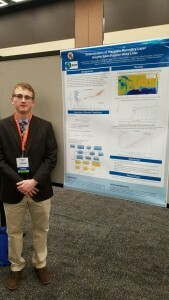 A case study from the summer 2013 campaign was presented to elucidate the role of Mid-Atlantic weather patterns on the offshore vertical wind profile, wind energy production and power curve performance variability. John Sullivan’s presentation titled “Monitoring Tropospheric Ozone Enhancement in the Front Range using the GSFC TROPOZ DIAL During DISCOVER-AQ 2014” discusses tropospheric ozone profiles retrieved from the new ground based National Aeronautics and Space Administration (NASA) Goddard Space Flight Center TROPospheric OZone DIfferential Absorption Lidar (GSFC TROPOZ DIAL) in Fort Collins, CO from 200 m to 16 km AGL. These measurements were taken as part of NASA’s DISCOVER-AQ campaign in July/August 2014. Measurements were made during simultaneous aircraft spirals over the lidar site as well as collocated ozonesonde launches.The GSFC TROPOZ DIAL is based on the Differential Absorption Lidar (DIAL) technique, which currently detects two wavelengths, 289 and 299 nm. Ozone is absorbed more strongly at 289 nm than at 299 nm. The DIAL technique exploits this difference between the returned backscatter signals to obtain the ozone number density as a function of altitude. The transmitted wavelengths are generated by focusing the output of a quadrupled Nd:YAG laser beam (266 nm) into a pair of Raman cells, filled with high pressure hydrogen and deuterium. Stimulated Raman Scattering (SRS) within the focus generates a significant fraction of the pump energy at the first Stokes shift. With the knowledge of the ozone absorption coefficient at these two wavelengths, the range resolved number density can be derived. Award: First prize for an oral presentation by a graduate student in the Weather Ready Nation section. Award: First prize for a poster presentation by a graduate student in the Resilient Coastal Communities and Economies section. Award: Second prize for a poster presentation by an undergraduate student in the Resilient Coastal Communities and Economies section. Award: Third prize for a poster presentation by an undergraduate student in the Weather Ready Nation section. UMBC Doppler Wind Lidar Research in Wind Energy was the featured article in the most recent issue of UMBC Magazine.